The genus Kalanchoe includes more than 100 plants, but only a few are regularly seen in cultivation. Kalanchoes are native to arid areas, and they are popular succulents. Modern hybrids are valued for their interesting leaf forms or for their flowers. Like poinsettias and holiday cactus, kalanchoes are staples of the holiday and florist trade. Flowering Kalanchoes are available in red, pink, yellow, or white. Because they bloom in response to the length of daylight, they can be encouraged to bloom even during the darkest days of winter. Like many succulents, these are not difficult plants to grow, providing you are careful with the water, especially in the winter. Light: They prefer bright, sunny locations, especially during the summer growing season. During the winter, consider a south-facing window. Water: Water moderately throughout the summer and reduce watering in the winter. Let the soil surface dry out between waterings, and in the winter, the plant can almost dry out - they thrive in the low humidity of winter households. Watch the fleshy leaves for signs of water distress. Temperature: They prefer warmth. Do not let fall below 55 F.
Many kinds of Kalanchoe will produce tiny plantlets along the leaf margins that can be individually potted up. These types include K. pinnata—the air plant—and K. beharensis. The more popular Kalanchoe—K. blossfeldiana and K. manginii—can be propagated by leaf cuttings or tips. To propagate by cuttings, sever a section of a few inches long at the beginning of the growing season and replant in warm, moist soil. Consider bagging up the cuttings to increase their chance of rooting and keep in moisture. K. blossfeldiana: By far the most popular Kalanchoe, with large flower heads in a variety of colors. They are forced into flower throughout the year, although they naturally flower in spring. K. manginii: Bears large, pendant flowers. K. porphyrocalyx: Also bears pendant flowers. Makes an excellent hanging plant. K. beharensis: Prized for its large, velvety, donkey-eared leaves in pale silvery green. K. pinnata: Fleshy, green leaves that bear tiny plantlets along the margins. Known as the Mother of Thousands. Kalanchoes are not particularly hard to grow, and the flowering varieties (K. blossfeldiana) are highly rewarding for their colorful and long-lasting flowers. Many people discard the plants after the bloom is over, but this isn't really necessary. Simply cut off the flowering head, let the plant rest with reduced water, and resume its normal care. It should flower naturally in spring. 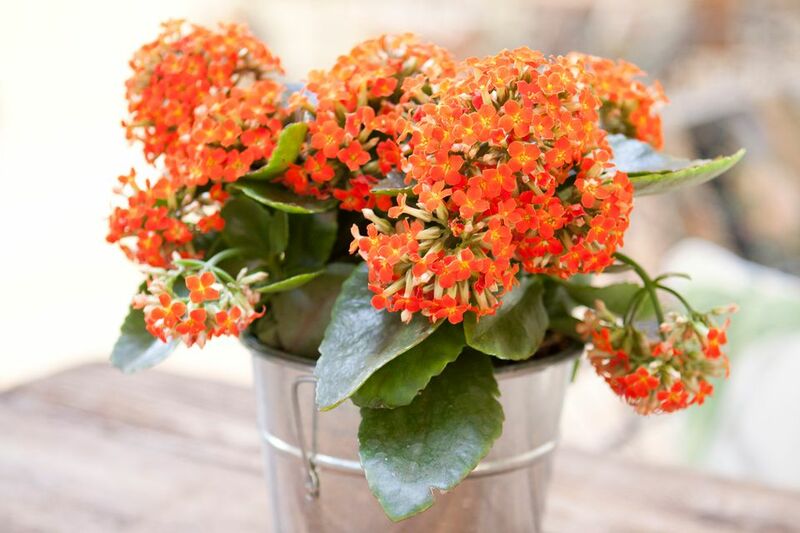 Professional growers force Kalanchoes to bloom throughout the year (they are a short-day plant). The two-pendant Kalanchoes make excellent hanging plants. Watch out for common household pests like aphids, spider mites, and scale. In small-scale infestations, they can be wiped away with a wet cloth, but more extensive cases could require an eco-friendly pesticide.